However, I’d really like a couple of lovely fellow hookers to test it first. 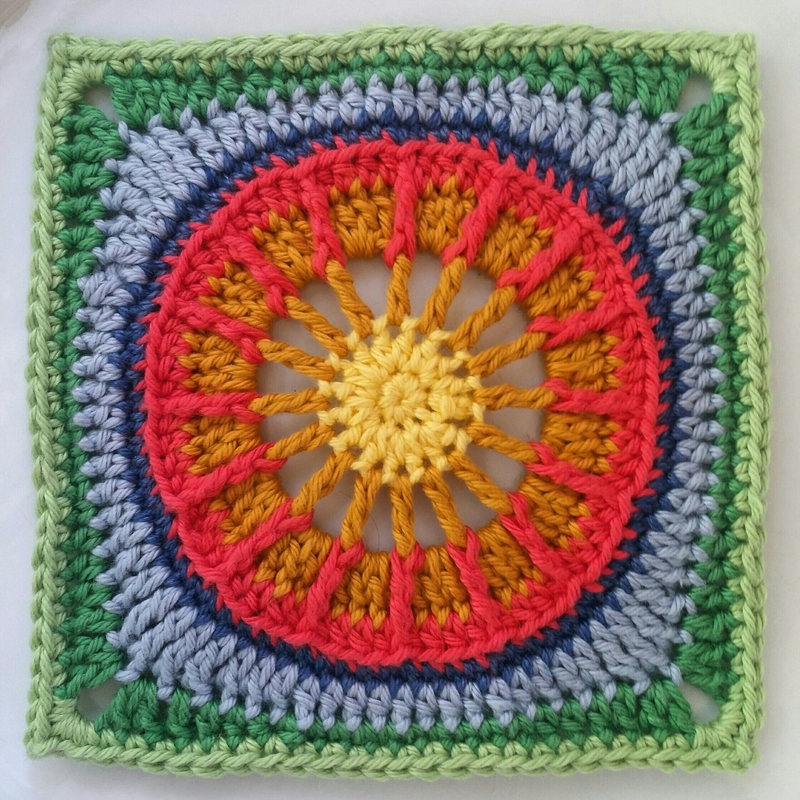 It’s a nine round block called ‘Winter Sun’. 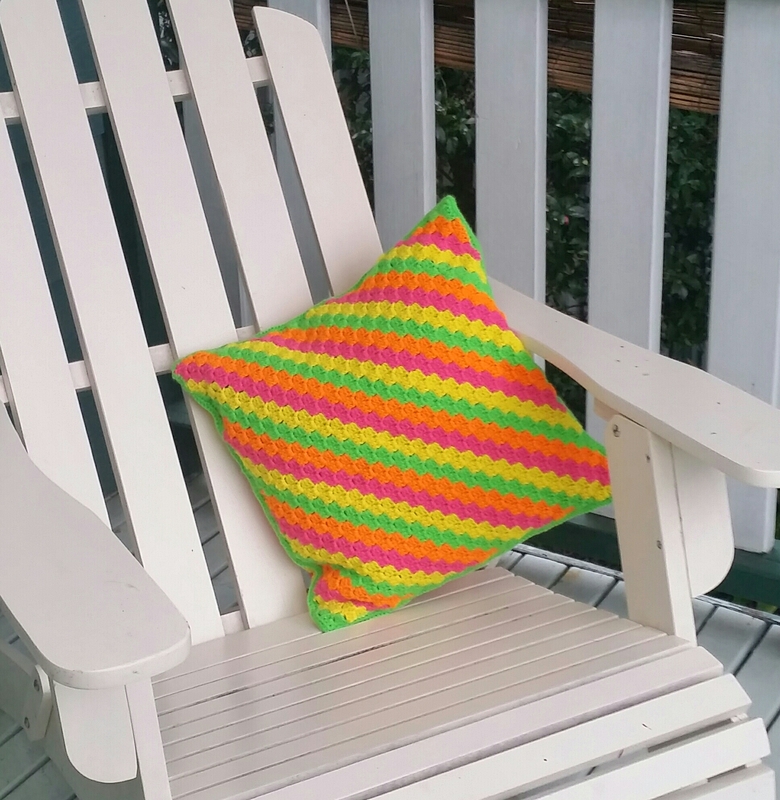 I’m thinking intermediate level as there are a few front posts, but that said, if you’re an adventurous beginner, I’d say go for it – I’ve found the best way to increase my crochet skills has been to attempt patterns with stitches above my current capability, and learn as I go! 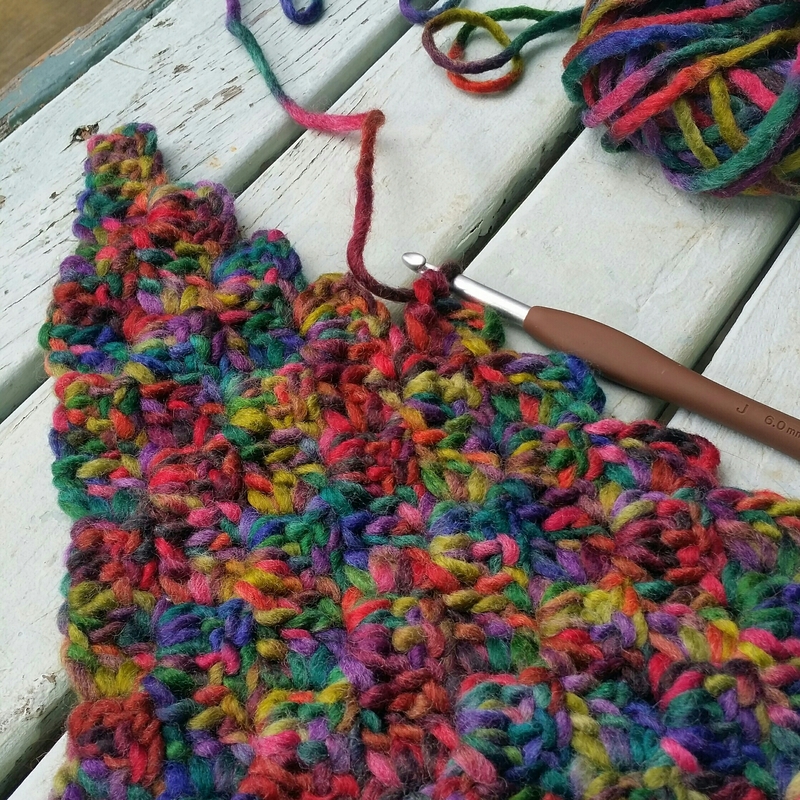 I’m a huge fan of standing stitches, but I’ve also included alternative chain starts. This PDF pattern includes a list of stitches used (US teminology), a couple of additional notes, and – what I consider to be, but I’m hoping you’ll correct me if I’m wrong! – clear and detailed instructions including stitch counts for every round (because I love patterns that have those!). Pending positive feedback / minor revisions, I’ll then make the pattern available here as a free PDF download, which will be closely followed by a pattern for yesterday’s ‘Winter in the Glen‘ square. I am finding being a mum somewhat challenging at present and am intensely grateful for my chosen forms of therapy: running – my half marathon training is on track – and of course, crochet 🙂 My girls are almost five and almost seven, and my joyous relief at being beyond the baby and toddler years and associated mental health issues (Post Natal Depression) is slightly tempered by the dawning realisation that with each new childhood era come new challenges which suddenly make teething and toilet training seem like a walk in the freaking park! 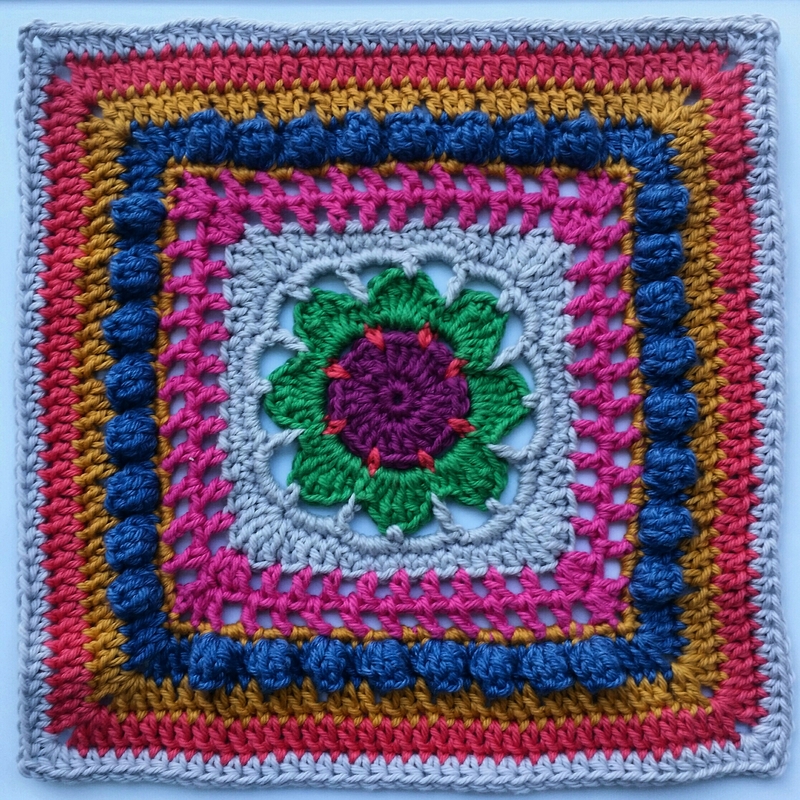 Ahhh, that’s better 😀 So, I taught myself Corner to Corner – C2C – crochet last week using this YouTube tutorial, and loved it. It hooks up into a nice solid fabric which I thought would be good for a bag. 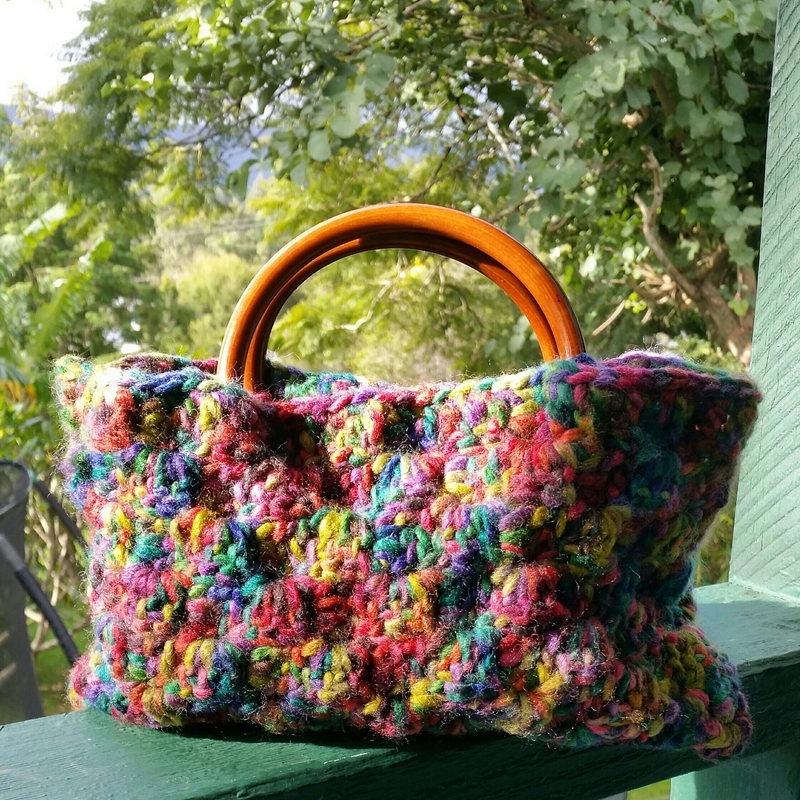 I experimented with a worsted-weight variegated yarn (Moda Vera Florentine Collection in Bruno) and a 6mm hook – one size down from the ball band recommendation, to add density. I kept increasing until the width measured about 11″ and then decreased on one side only until the long side measured about 14″ , at which point I began the decrease on the other side. Thus emerged a rectangle measuring approximately 14″ by 11″. I folded the rectangle in half lengthways and sewed the short edges together. Being impatient, rather than waiting for my D-shaped handles to arrive, I decided to use the 5″ hoop handles I already had. I centred the hoops and used four stitch markers so I’d know where to fix them in place. I went all around the opening of the bag in sc (US), including a single crochet around the hoop at each stitch marker. I then stitched the hoops securely in place on the inside. It was tricky and next time I will wait for the D handles! It’s Friday, and I finished a project! Woot! So glad I left my colour zone and got all impulsive in the yarn section of the dollar store. It doesn’t match anything in the house, but as I said to my husband, we can always redecorate… Anyways it’s looking all bright and buzzy on our bed right now and I love it! Took some pics outside earlier – weather is still horribly overcast, so rare for there to be so little sun and blue sky in this part of the world (subtropical), but these colours still zing and fairly cheered me up. 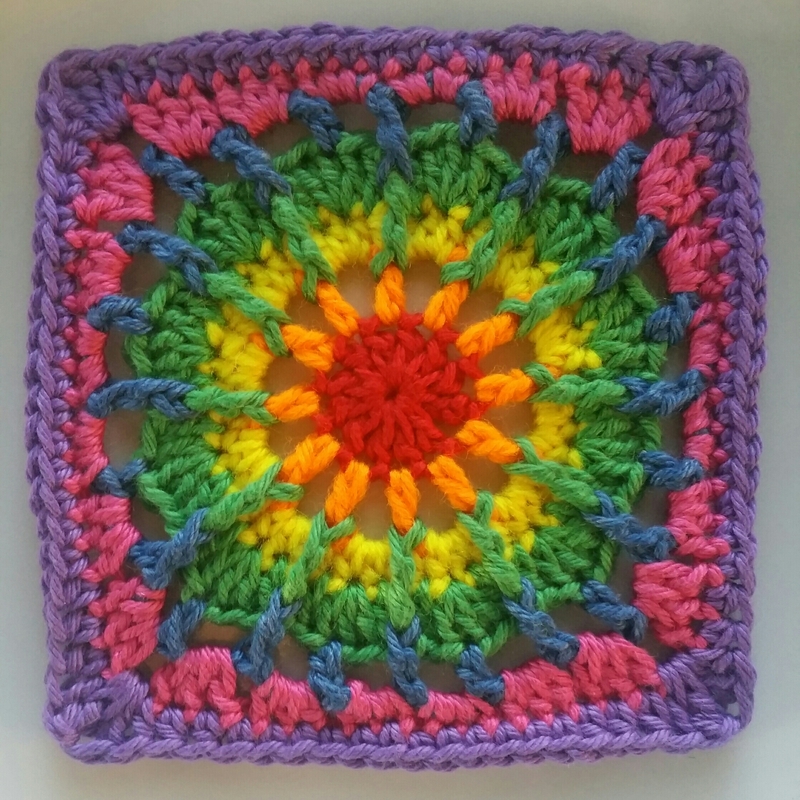 I’ve had a lot of fun learning Corner to Corner Crochet, or C2C, for this project. I used this You Tube tutorial and I loved it. Crystal clear instructions from both the spoken and visual perspective, and I absolutely recommend it if you’ve never tried C2C. 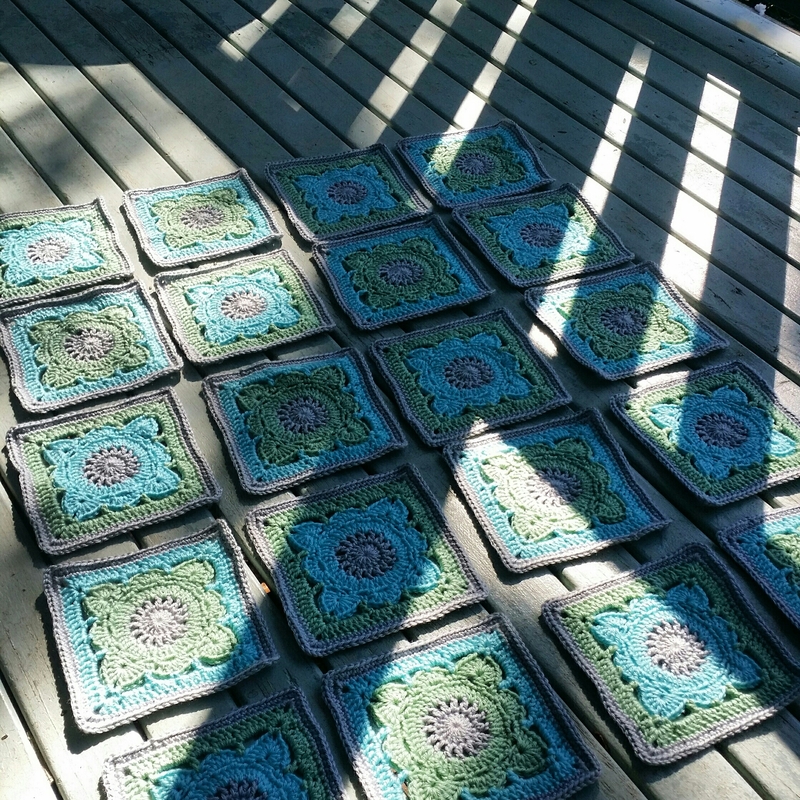 Briefly, on the making of the cushion cover: for the front, I made nine Willow blocks from the fabulous 200 Crochet Blocks by Jan Eaton – of course you could use any square. I joined them using sc (US) worked from the front, then added an sc edging. For the back, I simply made a C2C square the same size as the front, allowing for an sc edging. For the edging, I worked 3 sc into each C2C block. Then I joined back and front using sc. Tip: I struggled to determine which C2C side is right side. Let me save you the googling – C2C is fully reversible 🙂 It pays to pick your sides straight up though and put a stitch marker (or paper clip, or loop of yarn) into the back of your work – makes it quick and easy to see which side to weave into (as you go, right? Right? lol). C2C is easy to learn and opens up a wide and wonderful world of design opportunities, particularly in terms of pixel art – my head is bursting with ideas for new projects! Much to research and much fun to be had! Do you like C2C? 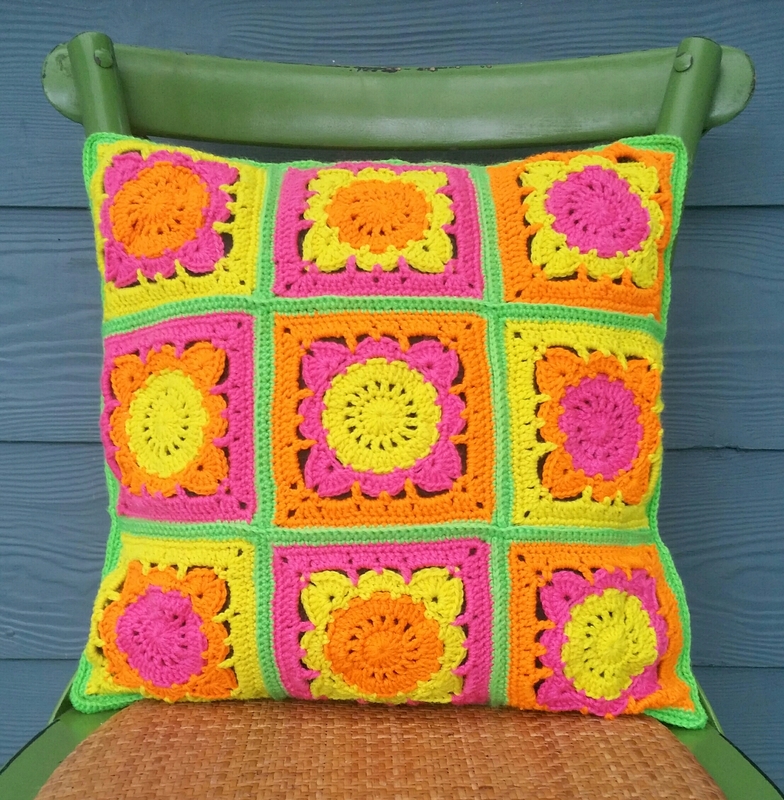 Have you created any pixel crochet?